Sales was impacted significantly in the cash dominated wholesale channel in the couple of weeks post demonetisation. The more discretionary categories like air fresheners, toiletries, personal carefaced bigger impacts. Staples and essentials were relatively less impacted and the impact was felt much more in the East and the North. Recovery has been fast and the quarter ended with 2% secondary sales growth. Some pockets like small rural wholesale are still under pressure due to demonetisation. Focused was increased on non-cash friendly channels such as modern trade, and modern trade business grew by 33%. Credit was extended by about six or seven days and it will be reverted back to zero general trade credit fromFebruary. A&P as a percentage of sales has been around 11%. In India, net profit growth was 19% and EBITDA Growth was 15%. Due to India-AS and forex impact of Rs36 crore, there has been a loss this year while there was a gain in Q3 last year of about Rs 10 crore. Due to a little more demand for low unit packs, focus on LUPs will be intensified. Aer air fresheners, Cintholdeos and Ezee liquid detergents are poised to become contributor to overall sales. For this quarter, innovation rate in India would close to 16-17%. 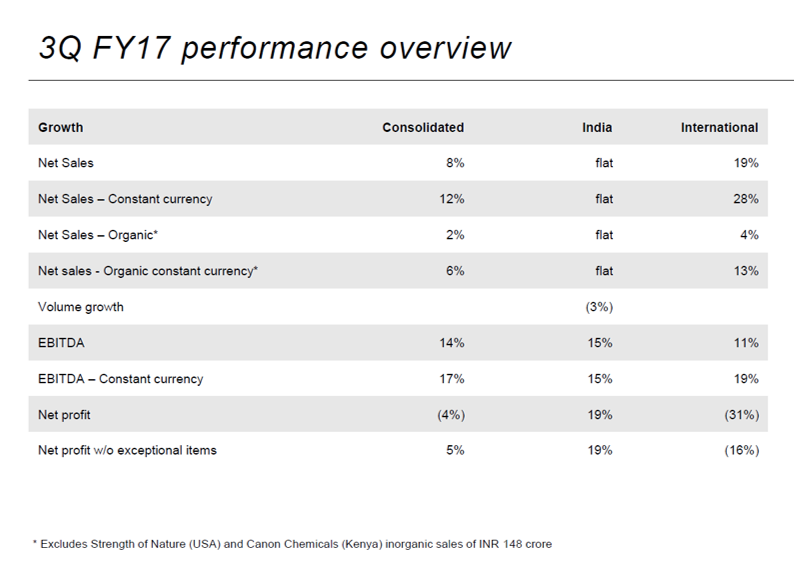 Gross margins expansion in India was due to lower consumer offers, and very select price increases in household insecticides towards the end of Q2 FY17. These consumer offers will not be present in Q4. Margins got impacted because of increased investments that were made in sales promotions. 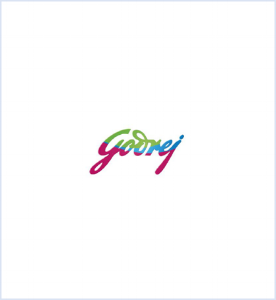 Godrej Expert Rich Crème grew in double-digits and reached its highest ever market share on an exit basis. ‘Dekhbhaal’ campaign has helped in increasing distribution and penetration lead over competition. Powders saw bigger challenges because of demonetisation than Crème. Due to the demonetisation, relatively urban-centric formats like LVs and aerosols did better while coils felt some pressure. Secondary sales growth was flat and was ahead of primary sales growth. Non-household insecticides part of company’s portfolio has been growing 12% to 13% every quarter. Focus area has been to strengthen rural distributionnetwork. There is a strong opportunity of gaining market share from unorganized players. Recently launched personal repellents range is receiving a very good response and production capacity is being increased to meet higher demand. Fewer sales of insecticides go through the chemists’channel. Anti-Roach Gel did very well after launch, but it has fallen off a little bit after that. Input cost pressures are being passed on by withdrawing offers and promotions and also taking selective price increases, which has resulted in destocking. Value decline in growth in soap is about 6%. This company is largely done with transition. Volume growth was also effected by demonetisation. Q4 FY17 is expected perform better in terms of volume compared to Q3 FY17. Delayed winter and the semi-discretionary nature of the category impacted demand, leading to some below historic growth rates. Currency challenges faced by the company international business has not much changed. 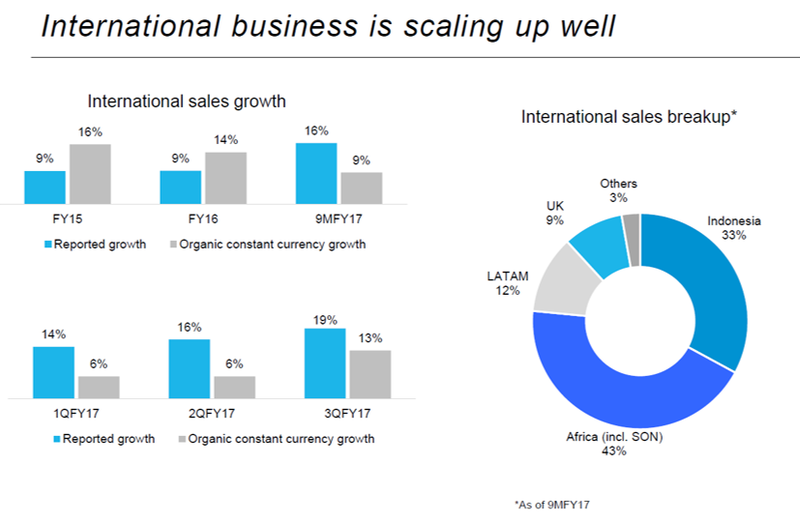 Organic constant-currency sales increased 13% and this was despite flat growth in Indonesia. Margins were lowdue to relatively higher investments across most of businesses. In Indonesia, flat growth was largely due to the slowdown in the insecticides business. Despite of overall FMCG sector decreasing in volume by about 4%, GCPL’s volumes grew by about 3%, and is expected to continue in Q4. For NYU, the hair care launch, initial response has been positive. The macro-environment remained soft, and the EBITDA declined off. Poor mosquito infestation season was also a problem faced by insecticides business. Darling is consistently delivering double digit growth. Strength of Nature’s business was low due to slowing ofshipments to Nigerian distributors due to dollar availability issues. Local manufacturing facilities in various countries in Africa are being set up. Margins are temporarily down due to currency devaluation in Nigeria, and investments in the businesses. Renew has become value and volume market leader in South Africa. Preparation is going on the wet hair care products in terms of their localisation of the SON business in Africa. Localisation will have significant advantages in terms ofimport duty. East Africa has outperformed the overall Sub-Saharan African growth rate. East Africa also has higher demand growth than both Nigeria as well as Southern Africa. Growth was good and investment is continued in Latin America. There are lot of margin expansion opportunities in Latin America, particularly Argentina. Quarter was good for European business and growth and margins expanded.